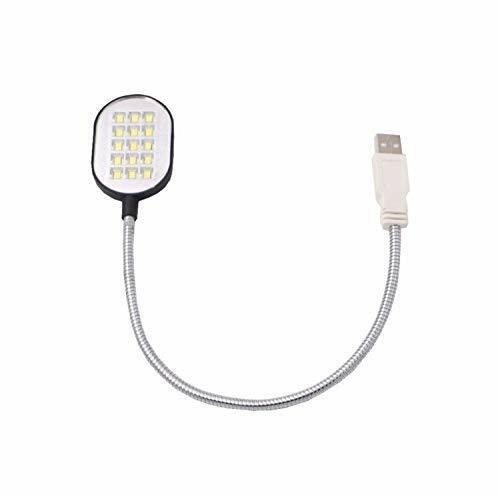 15 LED USB READING LAMP. This USB Reading Lamp is great for home, work, travel or recreation. The flex arm extends to shed light just where you need it. FEATURES - This reliable light features a gooseneck arm with 15 LED lights, No batteries required. DESIGN - Designed with a durable flexible gooseneck which allows you to direct light in any direction. COMPATIBILITY - Compatible with MAC and PC USB 2.0 and 3.0 ports on your laptop or desktop. USE - Can be used at home, in the office, while traveling or any remote location. We don't recommend you connect this lamp to device ports on printers, Smart TVs, Smart Chairs, and other non-host USB devices. 100% Brand new and high quality!! 15 LEDs, ultra bright. Powered by a PC USB port, needs no batteries and other external power. Flexible and adjustable metal neck. Soft and warm white light. Extremely long service life. Low power comsumption. Pluged into your PC USB port, it starts to bring you brightness right now. Lightweight, compact, space-saving, easy to carry and handle. An ideal companion for students, travellers, office workers, etc. Ideal for lighting your laptop in the darkness. If you have any questions about this product by GETHT, contact us by completing and submitting the form below. If you are looking for a specif part number, please include it with your message.